I’ve wanted to swim with whale sharks ever since I first find out about them. Floating around in the marine depths with the largest fish on this planet, racing to keep up with them, observing their huge tail, and their unique spotted skin, sounded like… well, a dream. A dream that I was happy to leave as such – just like I was feeling about cage diving with great whites. 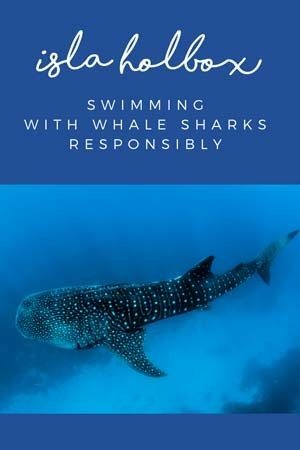 Swimming with whale sharks is possible in several locations around the planet, but it’s either questionable in terms of ethics (hello Oslob, Philippines) or prohibitively expensive (as it is the case in Ningaloo Reef, Western Australia). 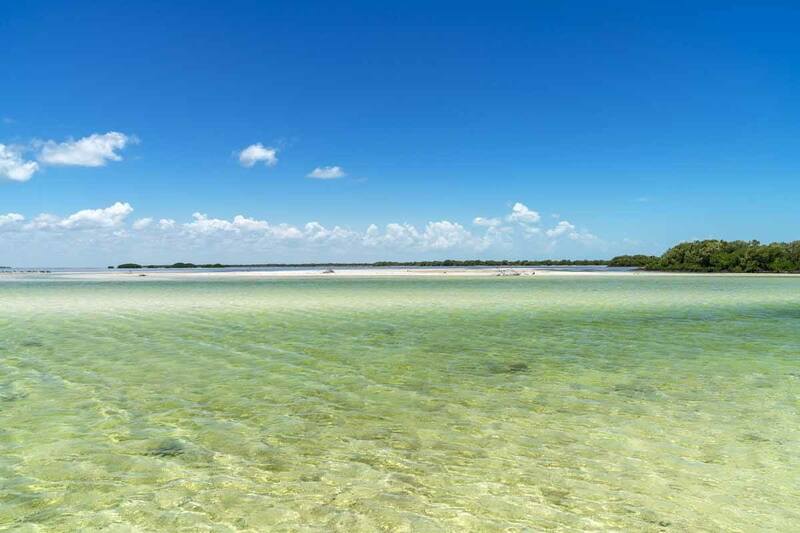 Then we found out about Isla Holbox – a place that hit the sweet spot between affordable and responsible whale shark swimming. Here’s all you need to know about swimming with whale sharks in Isla Holbox, Mexico – but first, let us share some things we learned about whale sharks, their habitat and behaviour. Are they Whales, or are they Sharks? Short answer – whale sharks are sharks, and as I said before, they just happen to be the largest fish in the world! Longer answer – whale sharks (scientific name Rhincodon typus) are indeed a type of shark. Their name comes from the fact that despite being sharks (therefore, fish) they have some features in common with whales, which are not fish but mammals. First things first, whale sharks are huge. A fully grown individual is between 6 and 12 meters long, and can weigh up to 20 tonnes, making them not only the largest fish, but also the largest non-mammalian vertebrate on the planet. The size of whale sharks is comparable to a bus – yes, I’m not joking! 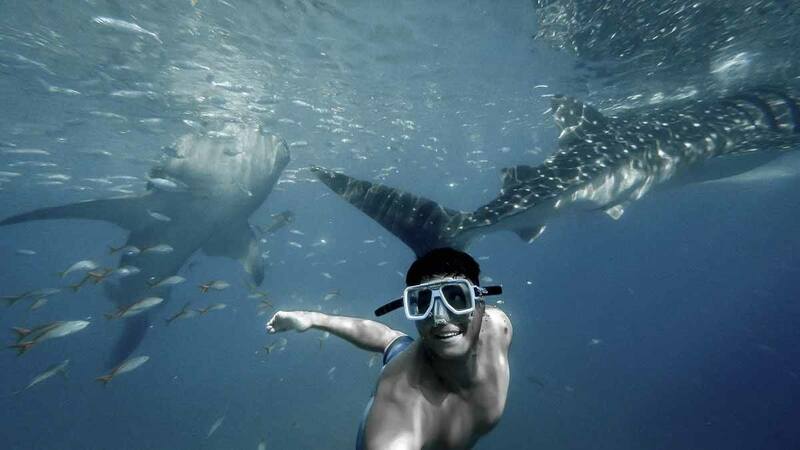 Whale sharks are not aggressive, they are known to be docile and even curious towards humans. They have huge mouths with over 3000 teeth, yet they pose virtually no danger to swimmers. Swimmers could in theory be hurt by a flick of their powerful tail, or trapped underneath the whale sharks if they dive down suddenly, but there’s virtually no instance of incidents involving swimmers and whale sharks. What and How do Whale Sharks Eat? I know what you may be thinking – if whale sharks are the largest fish on the planet, and they have huge mouths with 3000 teeth, how on earth can they NOT be dangerous? Whale sharks are filter feeders, and their diet consists of krill, plankton, fish eggs and other marine micro organisms. Whale shark teeth play no role in feeding – they are what in evolutionary biology is known as a vestigial trait, the remain of organs that were once more noticeable, but are now disappearing due to lack of use. Whale sharks feed by sucking down water laden with krill, plankton and the like, or by keeping their mouth open and swimming forward, swallowing water that is then expelled through the gills. Baleen whales have a similar diet and feeding behaviour – another trait in common between whales and whale sharks! What do Whale Sharks Look Like? Whale sharks have a large and flat head, with a wide mouth at the front, not tucked underneath as it is the case with sharks like great whites. They have a long, powerful tail with two pairs of dorsal and pectoral fins. Can you see their huge mouth? The most prominent feature of whale sharks is their spotted black and white skin. Each whale shark has a unique spot pattern, much like leopards and jaguars, and the pattern is used to identify individuals in research projects. The spots on the skin of whale shark are reminiscent of a starry sky – in Madagascar, another country where whale sharks are regularly seen, they are known as marokintana, meaning ‘many stars’. Sadly, yes. There is currently no estimate for whale shark numbers worldwide, but the IUCN lists the species as ‘endangered’ because of the ‘impacts of fisheries, bycatch losses, and vessel strikes, combined with its long life span and late maturation’ (source – IUCN Red List). Whale shark population is listed as declining, although since there are no estimates on their number, it is impossible to gather how close they are to extinction. Whale sharks are still slaughtered to fuel the Chinese shark fin trade – undercover Nat Geo journalists visited a fishery in China processing 600 sharks a year, with each carcass fetching upwards of $30,000. As a result, we believe it is more important than ever to support tours promoting ethical interaction between whale sharks and swimmers, showing that in the long run, conservation is more profitable than hunting and killing. 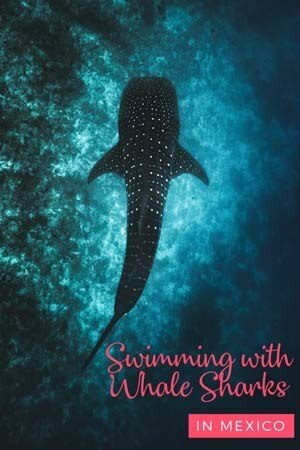 Where & When Can You Swim with Whale Sharks in Mexico? Mexico is the ideal destination for a responsible whale shark swimming experience – the industry is strictly regulated, and it is possible to swim with whale sharks almost all year round, in two different locations – Baja California, and off the northern tip of the Yucatan peninsula. In Baja California, whale sharks are regularly spotted between November and May in locations at the southern end of the Sea of Cortez. Between June 1st to September 15th it’s whale shark season in the Yucatan/Riviera Maya area, where the world’s largest aggregation of whale sharks happens in a place known as Afuera, an offshore location near Isla Mujeres. 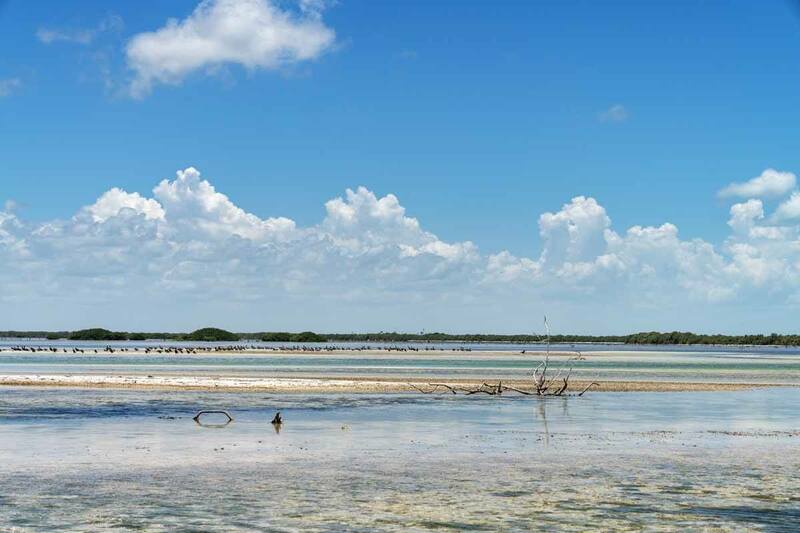 Not just whale sharks in Isla Holbox – there are also flamingos! Due to their feeding behaviour, whale sharks gather in large numbers in location where they can find lots of krill, plankton and fish eggs. 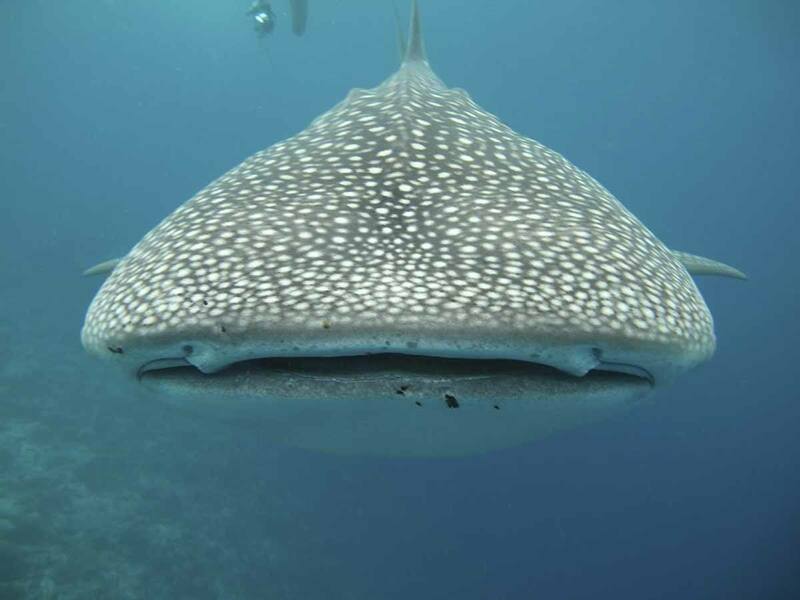 The reason behind the large numbers congregating near Isla Mujeres is that tunny (a small tuna species) spawns offshore between June and September, attracting record numbers of whale sharks looking for an easy feed. An aerial survey carried out in 2006 by Rafael de la Parra, a Mexican whale shark scientist, recorded up to 480 whale sharks congregating at the Afuera. During our 6 week-trip across Mexico, we visited Isla Holbox, a tiny island in the state of Quintana Roo, off the northern coast of Yucatan. 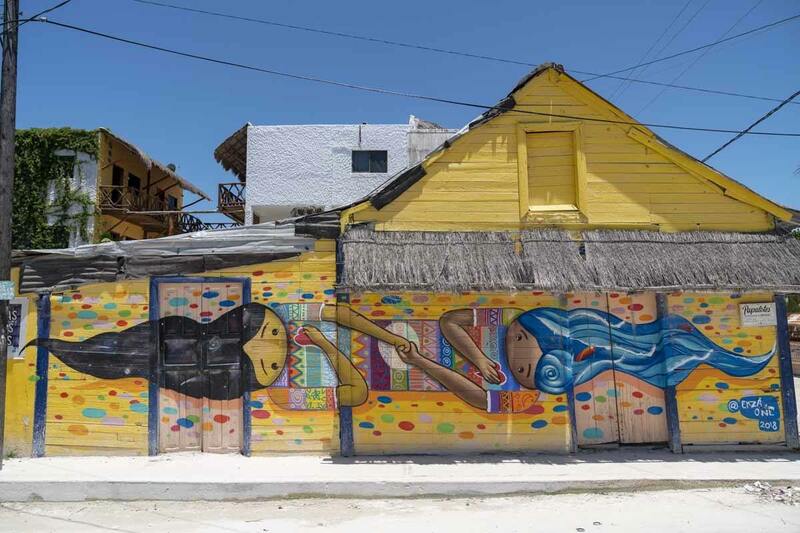 Unlike Tulum, Playa del Carmen and other places along the Riviera Maya that are now ‘tourist central’, Isla Holbox is still (relatively) offbeat – and it’s all about the whale sharks. 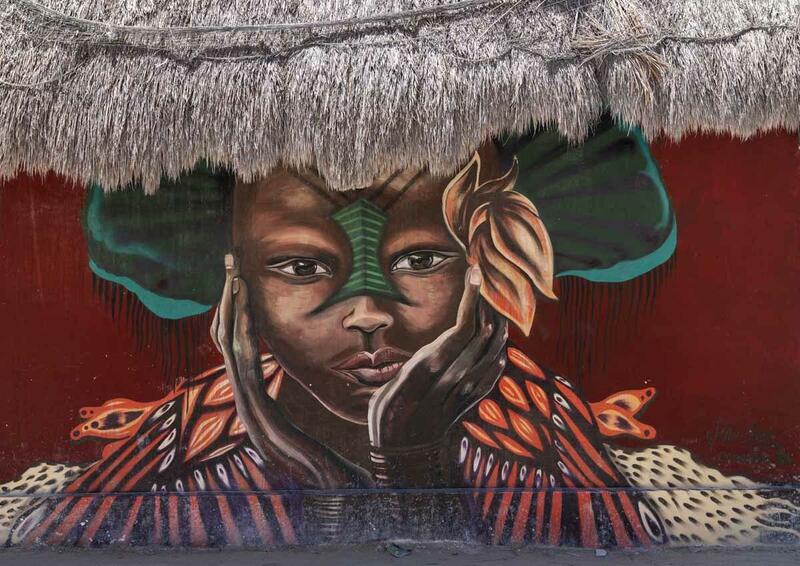 The island’s main street is Calle Tiburon Ballena (whale shark in Spanish), there were whale shark graffiti and posters everywhere, and we were lucky to have landed there right in the middle of whale shark season. 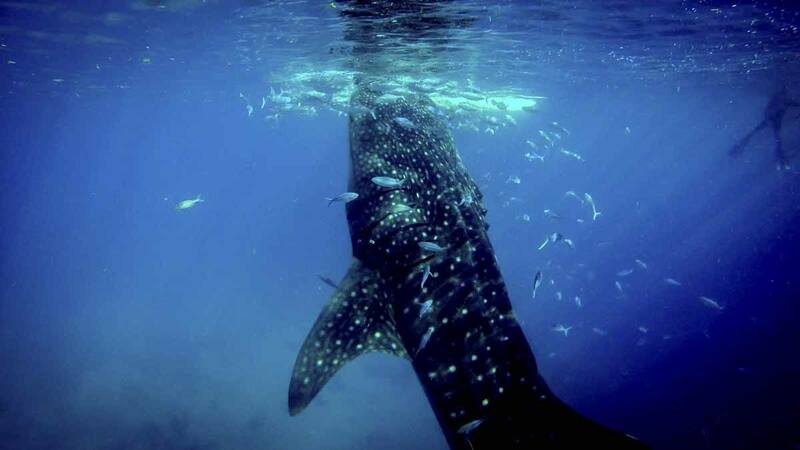 Every other shop offered whale shark tours, with prices starting around $125 USD per person. We spent half a day walking around chatting with operators, asking questions about sustainability – and we ended up booking a tour. Whale shark tours departing from Isla Holbox take place in the Afuera near Isla Mujeres, about three hours boat ride to the east. Isla Holbox whale shark tours are highly regulated – each boat carries a maximum of 12 swimmers, but only two are allowed in the water with a shark at the same time. Each boat has a captain and two guides, who are always in the water with swimmers. Lifejackets are compulsory, to prevent swimmers from diving down and getting too close to the sharks. Even though motorboats are used to travel between Isla Holbox and the Afuera, it is forbidden to ‘fire up’ the engine as soon as the whale sharks are spotted – a low rev must be kept as all times, as impact with speedboat engines is one of the leading causes of whale shark injury. The sharks are never fed – they come to the Afuera spontaneously early in the morning, all through the season. However, as one of the operators said, they are still wild animals, and there is simply no guarantee that they’ll show up. Isla Holbox operators used to offer refunds when whale sharks are not seen, but they stopped doing so, as this practice led boat captains to break the rules to prevent ‘no shows’. 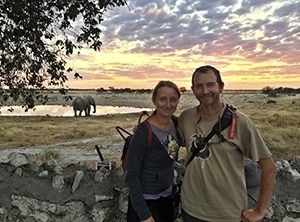 We ended up booking a trip with Willy’s Tours, because they had excellent online reviews especially in terms of compliance with whale shark regulations. 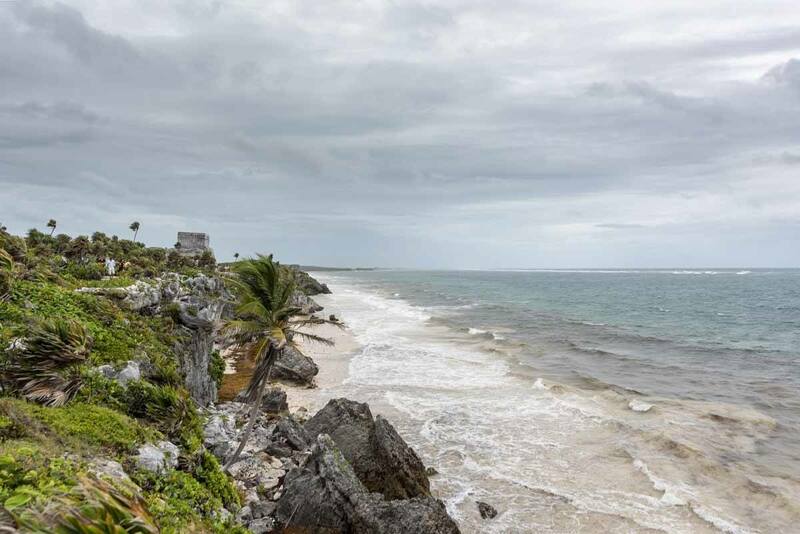 However, please note that it is hard to get cash in Holbox, and often operators do not accept cards – make sure you have enough cash before getting on the island! Tours leave at 7 am from the pier in the centre of Holbox – soon enough, we were sailing at full speed down the 42-km length of Isla Holbox, bound for Cabo Catoche, the northernmost point in the Yucatan Peninsula, where we turned away from the land and made for the Afuera. 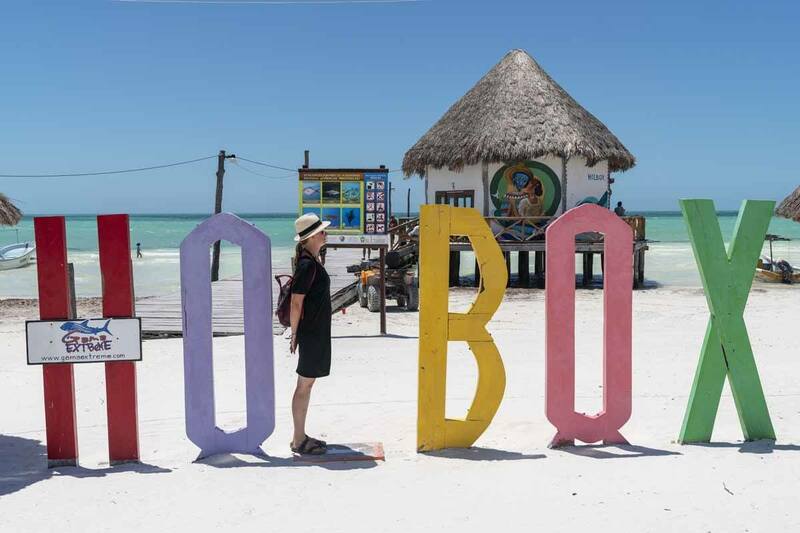 The tours leave from the pier just next to the Holbox sign! Sea sickness is a very likely occurrence on whale shark tours from Isla Holbox, since you spend a considerable amount of time on bumpy speedboats, but we were lucky – it was a sunny, windless day, and the sea was super flat. During the journey, we received a briefing on how to behave once in the water. We were supposed to always follow the guide, never touch or try to ride the shark, be at least three meters away from it and never swim towards or underneath it, only alongside – provided we could keep up! Our luck continued as soon as we reached ‘whale shark territory’. We had been warned by our boat captain that sometimes it is necessary to spend up to three hours looking for the sharks, cruising at low speed throughout the vast offshore area, until a captain spots one and alerts the other boats via radio. Yet, we spotted our first shark barely 5 minutes into our search. And then we spotted another. And another. We found ourselves right into the middle of the aggregation, surrounded by black and white spotted figures on all sides, zipping past us, underneath us, on all sides. Quick, quick! Mask, snorkel, fins, chaleco, let’s go! One of the guides grabbed us, and signalled we would be the first to jump into the water. As soon as I did, I looked around, and I saw the shark below me – long, graceful and elegant, and blissfully unaware of the excitement going on above. 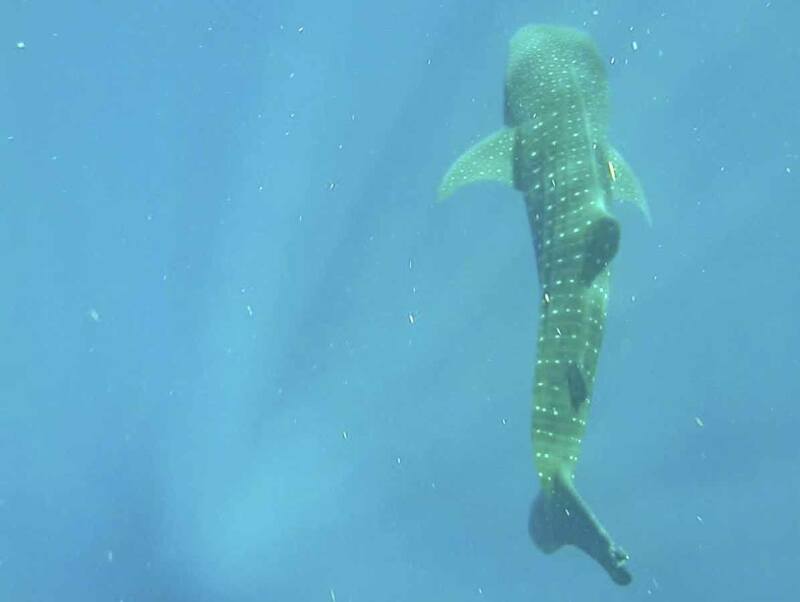 The first whale shark we spotted – and the only pic we were able to get! We followed it for a while, until it darted off with a flick of its tale. It was probably eight or ten meters below us, so we couldn’t really tell how big it really was – later, our guide told us it was a juvenile, about four meters long. Exhausted, speechless and keen for more, we clambered back onboard, and let everyone else on the boat have a go. By then, lots more boats had arrived – not only Isla Holbox whale shark tours visit the Afuera, but also tours from Isla Mujeres, Cancun, Playa del Carmen and beyond. We counted about 50 boats, but we were lucky that there were over 150 sharks in the water at the same time, so there was no pushing or crowding the sharks. Once one was ready to move on, another would take its place – and we all managed to have not one, but two encounters. The second encounter was even better than the first. The shark was much closer this time, and was aware of our presence, and soon it started swimming towards us. Following our guide’s lead, we swam away, trying to keep the required distance – but the whale shark was faster, and it stopped barely a meter away from me. 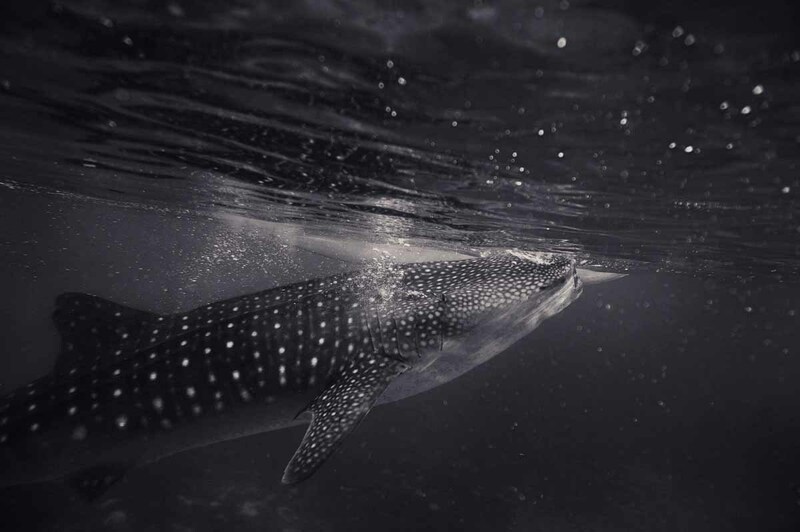 I saw its spotted skin clearly, which really does resemble a starry sky, and kept paddling without moving, mesmerised by its presence and sheer size – until once again, it swam off. Just love the colour of this water! 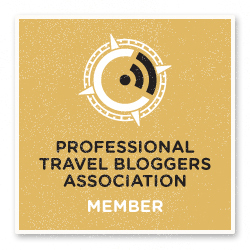 Are Isla Holbox Whale Shark Tours Responsible? Our experience swimming with whale sharks in Mexico was magical, and rules and regulations were adhered to at all times. We never saw more than two swimmers on the water at the same time, never saw more than one boat close to each shark, and never noticed swimmers getting too close to sharks, or touching them. However, we can only speak for what we saw. The day we went to the Afuera from Isla Holbox there was a record turnout, with over 150 sharks – but there are also days with only 20 or 30 individuals, and hundreds of boats taking turns. Do tour operators stick with responsible interactions even on those days, with disgruntled, seasick passengers pressuring them to let more people in the water? We have no way of knowing – I can only say that first-hand I witnessed nothing but responsible behaviours towards whale sharks. Sadly, I cannot say the same for the second part of the tour. After the whale shark sighting, we were taken to a spot near Isla Contoy, where we snorkelled for about half an hour while boat crews prepared lunch. Not far from here is where we had lunch! The waters were teeming with marine life – there were manta rays, barracuda, angel fish, banner fish and many others floating by, plus lots of turtles. We saw people touching and grabbing turtles, and shrugging when we told them not to. We were extremely happy with the tour and the whale shark sighting, but these irresponsible interactions with turtles left a bitter taste in our mouth. With such a strong focus on whale shark conservation all over Isla Holbox, we really didn’t understand why we weren’t briefed on how to interact with turtles and all the other marine species. True, whale sharks are unique and amazing – but so are turtles, barracuda, rays, all creatures of the sea are worthy of care and respect. By all means, take a whale shark tour if you happen to be in Isla Holbox – but if your boat crew doesn’t say anything about not touching turtles and other animals, please do say something. Conservation also needs small gestures like these – and marine life will thank you. Ferries to Isla Holbox depart from Chiquilà, which has regular bus connections from Cancun, Tulum, Valladolid and other destinations around the Yucatan peninsula. Check the ADO and Mayab sites for info on bus schedule. In Chiquilà, the bus will drop you off close to the pier. There are two ferry companies, 9 Hermanos and Holbox Express, departing every half hour. Tickets cost $150 MXN one way. On your way back from Holbox, you’ll have to walk to the palapa (straw hut) on the main street near hotel Puerta del Sol to catch your bus. It is highly recommended to get onwards tickets before you reach Chiquilà, especially in high season, otherwise get there early! 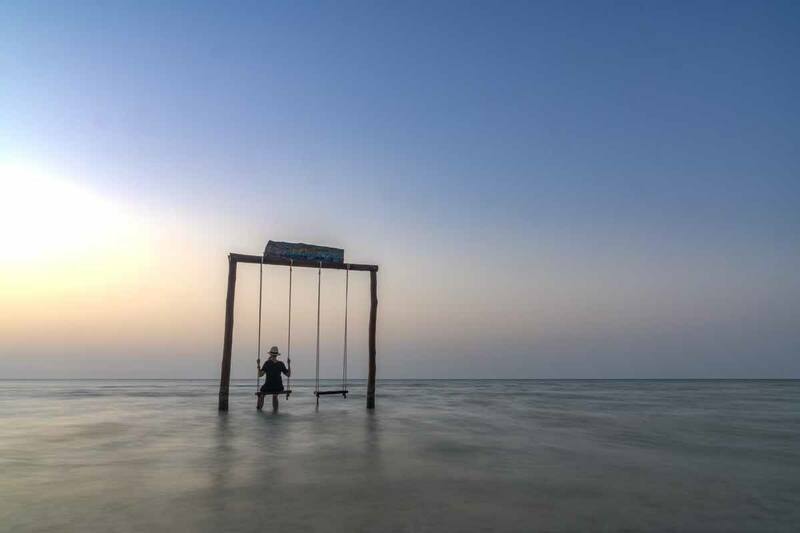 Holbox is a fairly small place, but it still a few kilometers from side to side. Since no cars are allowed on the island, you can either rent a bike or golf cart to get around – ask your accommodation for assistance. 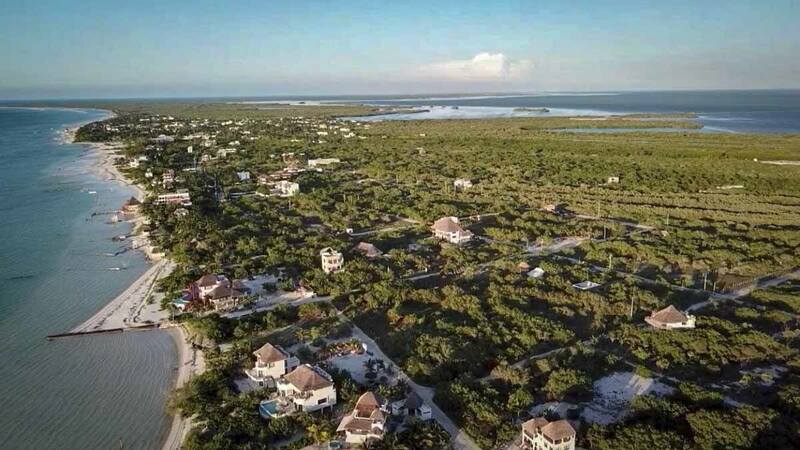 Golf cart transfers are also the best way to reach your accommodation from the Holbox pier. Prices range between $80-150 MXN, depending on where on the island you have to go. 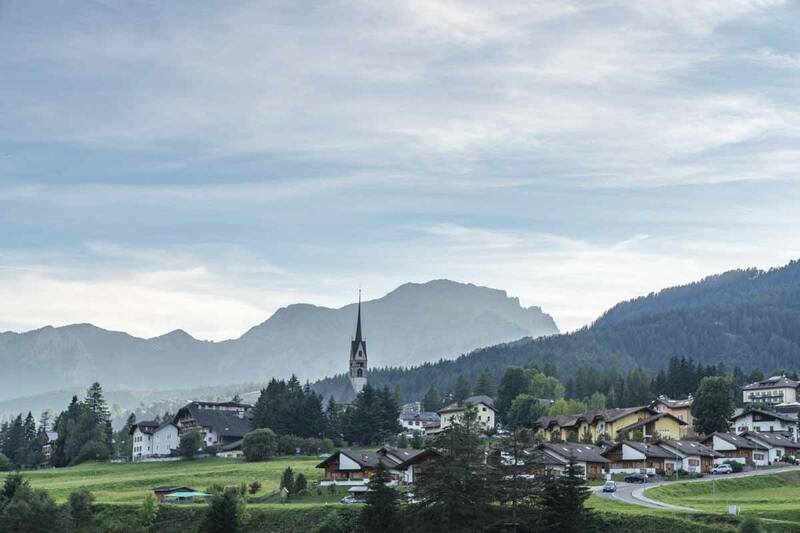 You can get a taxi on the street or as your accommodation to arrange one. Casa Las Tortugas Petite Beach Hotel – you’ll barefoot luxury in this stunning beach hotel, one of the best in Holbox, as well as a great spa!